How quickly will you ship my purchase? We ship items Thursday and Friday, except holidays. We ship most purchases within 3-5 days. We have multiple warehouses and a retail store in Pittsburgh, but ship from our central shipping office, so it can take as long as five days to ship your items. If you have additional questions about shipping please contact us (click here). Do you ship internationally? Do you ship outside of the Continental USA? Our shipping calculator is not always accurate when calculating shipping to areas outside of the Continental USA, that are Hawaii, Alaska, US Territories or US Military addresses. For quotes, please contact us, and let us know which products interest you, as well as the quantities that you need, we will provide you the quote to ship to your location. Effective March 26, 2019 we will no longer ship orders to locations that are NOT USA. We offer swatches for most of the Home Dec fabrics and trims that are offered on our website, or in our store. Swatches are NOT available for Quilt Weight Cotton Fabrics. Please be aware that monitors and device display screens may render images of our products differently between devices, due to personal settings, screen resolution, and other mysterious technology related reasons. Most of our cut-to-order fabrics and items are NOT RETURNABLE. We recommend requesting a swatch, if you are unsure of how the color may appear in your own location and lighting. If you would like to receive a swatch, please contact us using this link (click here). Your Fabric, Trims and Ribbons are cut to order. They are not returnable. Vintage items and artwork are not returnable. Swatches are available for most items. I need help with my order. If you have a problem with your order, or need to purchase more of an item, please click here. We will follow up with you as quickly as possible. 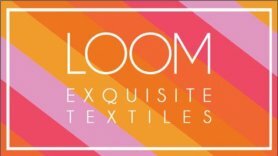 When I visit LOOM retail store, will I be able to see all of the items that you offer on your website? Most of our products are available for purchase at our retail store in Pittsburgh. Contact us to ensure that the products that you are interested in purchasing are located in our store when you arrive. (click here). We have multiple warehouses in Pittsburgh. We simply do not have enough space at our Penn Avenue store to keep all of our treasures -- be sure to contact us so that we can arrange to have the items in which you are interested, available for you to see. We are located at 2124 Penn Avenue, Pittsburgh PA 15222. Visit the Historic Strip District in Pittsburgh!